For tobacco chemists, neuroscientists studying nicotine, clinical researchers, policy makers as well as tobacco and pharmaceutical industry scientists. Foreword. List of Contributors. Pharmacological Significance of Nicotine (E.F. Domino). Biosynthesis of Nicotine and Related Compounds (L. Bush et al.). Biotransformation of Nicotine and Related Tobacco Alkaloids in Mammalian Systems (J.W. Gorrod, G. Schepers). Chemical Properties of Nicotine and Other Tobacco-related Compounds (P.A. Crooks). The Physical Chemistry of Nicotine (J. Banyasz). Use of Gas Chromatographic and Mass Spectrometric Techniques for the Determination of Nicotine and its Metabolites (P. Jacob III, G. D. Byrd). Use of High-Performance Liquid Chromatographic-Mass Spectrometric (LC-MS) Techniques for the Determination of Nicotine and its Metabolites (P.A. Crooks, G.D. Byrd). Use of Immunoassay Techniques for the Determination of Nicotine and its Metabolites (J.J. Langone et al.). Determination of Nicotine in Tobacco, Tobacco Processing Environments and Tobacco Products (M.F. Borgerding et al.). Determination of Nicotine in Pharmaceutical Products and Dietary Sources (D. E. Leyden et al.) Nitrosamines Derived from Nicotine and Other Tobacco Alkaloids (S.S. Hecht, A.R. Tricker). Determination of Nicotine in Mainstream and Sidestream Cigarette Smoke (K. Rustemeier, J.-J. Piadé). Nicotine in Environmental Tobacco Smoke (M.W. Ogden, R.A. Jenkins). Determination of Nicotine and its Metabolites in Biological Fluids: in vivo Studies (R.A. Davis, M. Curvall). 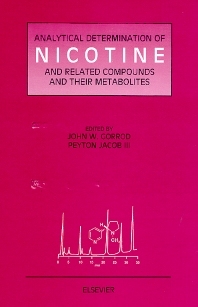 Determination of Nicotine and its Metabolites in Biological Fluids: in vitro Studies (J.W. Gorrod, M.C. Tsai). Uses and Abuses of Cotinine as a Marker of Tobacco Smoke Exposure (P.N. Lee). Index.